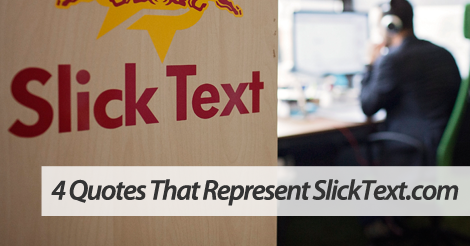 If you’re a valued customer on the Slick Text network, you’re no stranger to our constant innovation. We’re an online texting service that always wants to do more. Good enough is never enough. We want to exceed our customer’s expectations, and help them exponentially grow their business using our service. Here’s four of our favorite quotes that accurately represent our desire for greatness. Whether you like it or not, new technology acts as a catalyst for change in the marketing industry. Instead of fighting this change, we want to embrace it. We want to bridge the gap between small business owner and text marketing. We’re always looking to better ourselves, both personally and professionally. We push each other to reach new heights. Our customers simply reap the benefits of this quest for success. Sure, sometimes we screw up. We never claim to be perfect. But, when we make mistakes, we take ownership of our wrongs, and work to make them right. After these situations, we walk away smarter and more aware of our customer’s needs. This is definitely our favorite in house mantra. We want you, our valued customer, to have a direct say in our growth. We’ll never create for creation’s sake. Every new feature or development is designed with you in mind. 2016 is the year of the text message. Partner with our online texting service, and watch as your offer redemption and customer engagement soar. Ready to get started? Give us a ring at 1.800.688.6290 or head over to the pricing page and sign up for a free plan.